Last month, on June 27, 2013, the nation witnessed history on the floor of the Senate. Through a formal floor vote, utilized to mark the momentousness of the occasion, 68 Senators voted for the The Border Security, Economic Opportunity and Immigration Modernization Act of 2013 (S.744). Two broad “frames” – perspectives and conceptualizations – have surrounded the debate over the bill: one, on the left, emphasizing immigrants’ contribution to the nation, the other, on the right, claiming that immigrants harm the nation. While this is the most significant piece of immigration legislation in almost 30 years, many of us were left with strongly mixed feelings. The reality of this bill is the coexistence of a few pro-immigrant rights provisions and unprecedented enforcement provisions. A path to citizenship for the nation’s 11 million undocumented individuals is critical for both health and human rights; yet our nation’s immigration enforcement and deportation policies have proven incredibly harmful to immigrant communities. Now, with S. 744, this proposed pathway to citizenship will not only be long and dubious (and open to only about 7.5 million individuals), but was purchased through the concession of $40 billion in border militarization, increased employer enforcement, and additional interior enforcement. For more details on the bill, check out the National Immigration Law Center’s summary and analysis. The Senate bill is a product of two frames that have been wielded in the debates over immigration reform in the US. Each side has strategically used frames to make their case. Framing is the process by which our brains package and process information. As we gather information and experiences, frames are the means by which we associate our values, perceptions and attitudes with cues, such as images, sounds or words, from the world around us. Frames are powerful because the values, perceptions, and attitudes that are conjured up by these cues can influence how people view an issue. Here’s a quick example: The federal enforcement program, Secure Communities (SCOMM), utilizes a frame that taps into perceptions of undocumented immigrants as dangerous lawbreakers. It is described by ICE as a program that “protects the communities that [ICE] serves…[and] prioritizes the removal of criminal aliens, those who pose a threat to public safety…” Tapping into anti-immigrant attitudes, the word “secure” and the idea of “protection” imply that SCOMM is necessary for community safety. As we know, it is a harmful program and, perhaps, all the more so because it has been rolled out on the premise of safety. As evident in this example, social values, perceptions and attitudes can be both shaped by and reflected in frames. Looking at those utilized to shape the immigration bill debate can give us some insights into current attitudes, perceptions and values around immigration. Two principal frames have been used in the immigration debate. On the left, is the frame of contribution – by all immigrants. 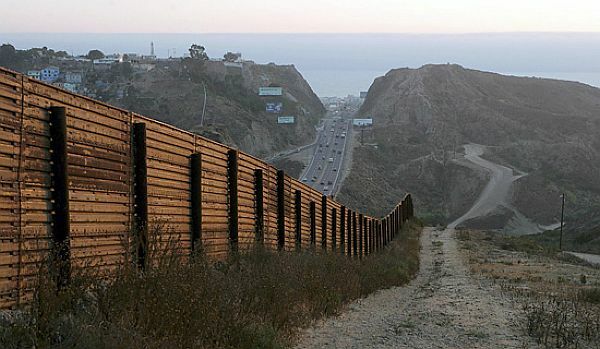 On the right, is a frame of harm – caused by undocumented immigration. Both aim to frame the debate in a manner that taps into American values. Within each frame are arguments around what it means to be “American,” with each side laying claim to the definition, and arguments that link immigrants with either positive or negative economic impacts. The contribution frame makes the case for the indispensability of all immigrants, including those who are undocumented, to our society, culture, and economy. This frame helps to make the argument that their vital role has earned undocumented immigrants the right to citizenship. Many advocates for a path to citizenship focus on the economic benefits of immigration and citizenship. Undocumented immigrants add to the economy, with a path to citizenship contributing an estimated $832 billion increase in GDP. Undocumented immigrants pay taxes, including an estimated $115 billion surplus contributed to Medicare. There is also a significant focus on supporting the unity of immigrant families – highlighting the negative impact of the 1.5 million deportations in President Obama’s first term and the 5,100 children in the foster system following their parents’ deportation. This frame builds from the nation’s history of, and appreciation for, immigration and humanizes the experience of undocumented individuals. If asked about the contribution of immigrants, most people in the United States could provide multiple examples and invoke images of immigrant college students or service members. Therefore, it is no surprise that there is strong support for a path to citizenship among the public. 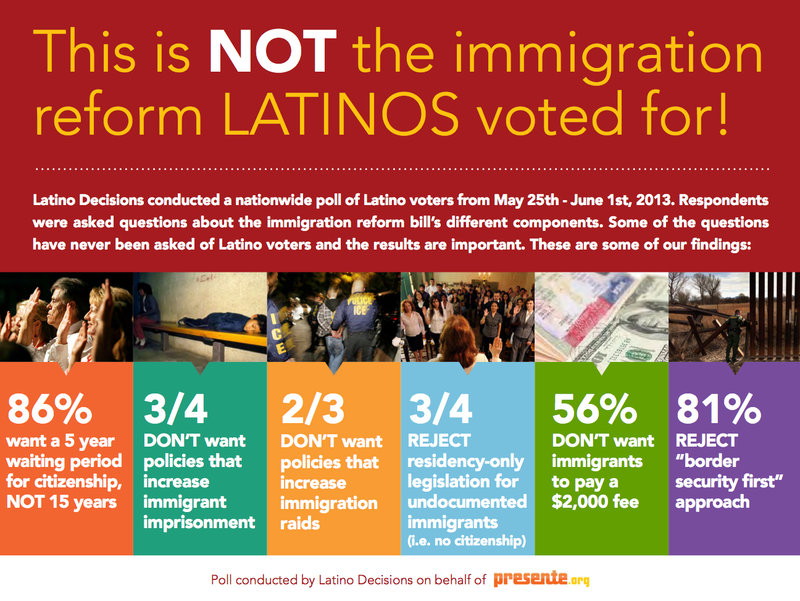 Multiple polls demonstrate that a majority of voters, and a large majority of Latinos, want undocumented immigrants to have the chance to stay in the United States as citizens. The harm frame, on the other hand, taps right into the nation’s pulsing vein of xenophobic sentiment. In the debate over the bill we have heard outright race-based fear mongering. For example, undocumented immigrants are portrayed as a threat to “cultural cohesion” or as invaders who change the American way of life by their reluctance to assimilate. Opponents of a path to citizenship argue that there are not enough resources to share with undocumented immigrants and those undocumented immigrants take jobs and public benefits. These arguments strategically construct a frame that cuts right to the core of many people’s fear of immigrants. At the heart of the harm frame is the attitude that undocumented immigrants are rule-breakers, at best, and criminals, at worst. Sadly, the frame of harm has been very effective at criminalizing undocumented immigrants. Political debates, media coverage, etc. are chalk full of explicit portrayals of undocumented immigrants as a threat to the “rule of law.” Remember 2010 Senate candidate Sharron Angle’s anti-immigration ad? Or Mitt Romney’s famous idea for “self-deportation”? In the recent Senate debate, despite the extraordinary border enforcement concessions, Senator Session (AL) declared that Republicans want “a lawful system.” The union of ICE employees declared that the bill will legalize “thousands of dangerous criminals.” Just this week anti-immigrant leader and US Congressman Steve King said, “For every [undocumented individual] who’s a valedictorian, there’s another 100 out there who weigh 130 pounds and they’ve got calves the size of cantaloupes because they’re hauling marijuana across the desert,” bringing together both racism and criminalization in an offensive attempt to prove the harm of immigrants. Over the years, pro-immigrant groups have launched campaigns with messages such as “no human is illegal.” However, the frame of contribution has yet to effectively counter the criminalization of undocumented immigrants. Even in many arguments advanced by the contribution frame is an implicit finger-pointing – that those who are undocumented have done something wrong or are solely responsible for their legal status. Therefore, upsetting as it is, it should come as no surprise to learn that among the public and even more progressive members of Congress, there also strong support for enforcement and border militarization measures prior to achieving citizenship. The Senate bill contains both of these frames. The coexistence of citizenship provisions and enforcement and border militarization provisions is a reflection of the coexistence of these two frames in our national dialogue around immigration. Politicians and the public are willing to accept the contributions of some immigrants, while still believing in the harm and criminality of other immigrants. The result is a piece of legislation that acknowledges, at some level, the important contribution of undocumented immigrants and the need to provide them with a (lengthy) path to citizenship, but that also makes damaging investments in border militarization. And, as for the House, the Republican majority would rather avoid the topic of immigration altogether. It is critical to frame the pro-immigrant debate beyond the contribution of immigrants. Among supporters of a path to citizenship, efforts to oppose the border militarization provisions are reclaiming the harm frame. A National Day of Action Against Border Militarization took place on July 17th to bring attention to how harmful border militarization is to everyone. Detention Watch Network developed an infographic spelling out the huge costs (and harm) of the bill. provisions in the bill. Most recently the DREAM 9, a group of young who had previously returned or been deported to Mexico, made a public attempt to cross back into the United States. Their action of leaving and then trying to return to the US has highlighted the arbitrary and unjust nature of our immigration system, turning the frame on the system, rather than on immigrants themselves. Frames serve as filters for how the public views and understands debates around immigration. It is imperative that we promote frames that support basic decency and rights for those who are undocumented.